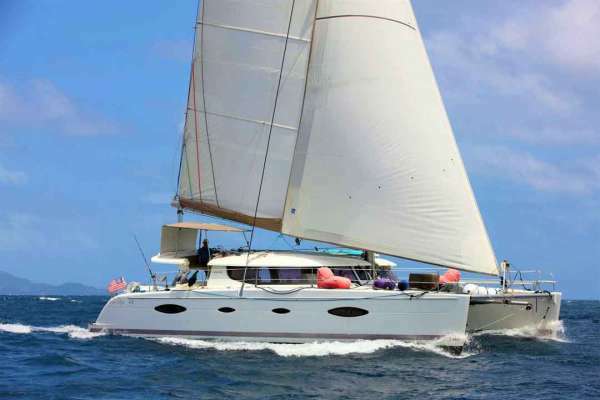 Catamaran My Cherie Amour is a 2014, 48’ Fontaine-Pajot catamaran offering crewed yacht charters in the BVI and USVI. 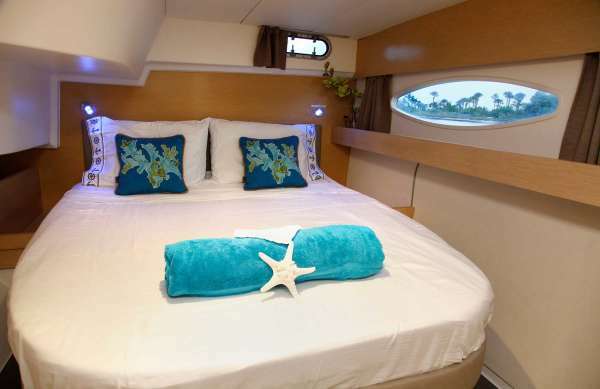 She features accommodations for up to 6 guests in 3 Queen cabins. 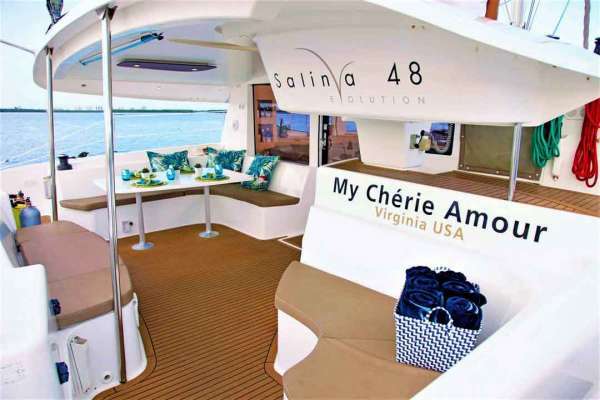 Catamaran My Cherie Amour is a Carefree Yacht Charters affordable pick for families, couples, divers or special occasions. 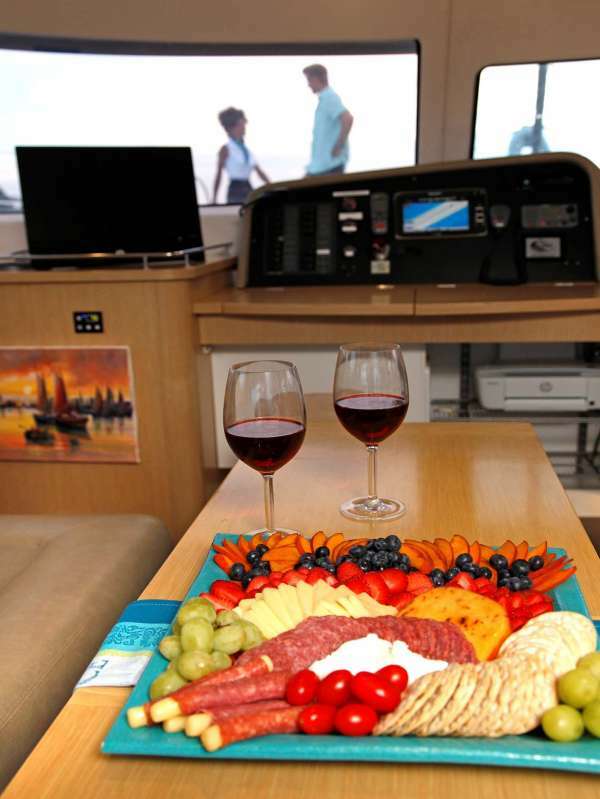 Here's what Ben and Holle told Carefree Yacht Charters about their general interaction with guests: "We are your liaisons to peace and relaxation-- desiring to be involved with our guests to ensure their needs are met and are entirely entertained. 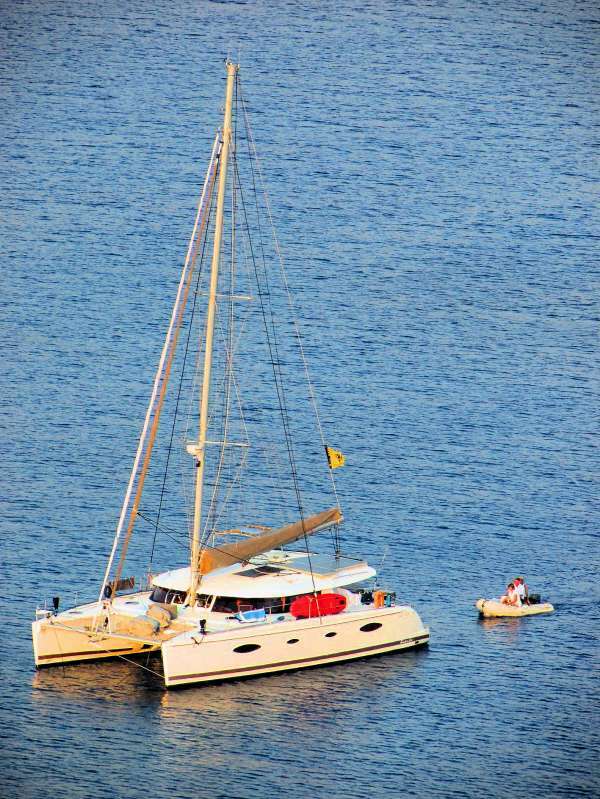 Having spent a great deal of time in the BVI's, we'll share many locations with guests that are rarely visited as well as popular landmarks for our guests to enjoy exploring. One of our favorite elements of sailing is the opportunity to see the most beautiful sunrises/sunsets. 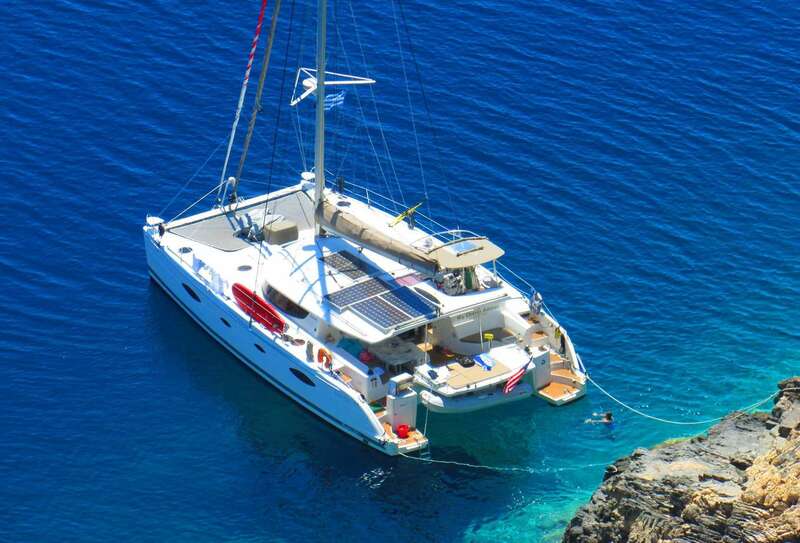 There is nothing more profound than, after a day full of activities, dropping anchor in a beautiful anchorage and watching the sunset cast rays of orange light through the pink and purple sky while enjoying an ice cold beverage and warm conversation." Rates from $14,400 to $16,000. View availability and rate details. To learn more about this crew or for further details about MY CHERIE AMOUR, call us in our South Florida office at (954) 980-9281, toll free at (888) 670-6884 or fill out our Quick Request Form. 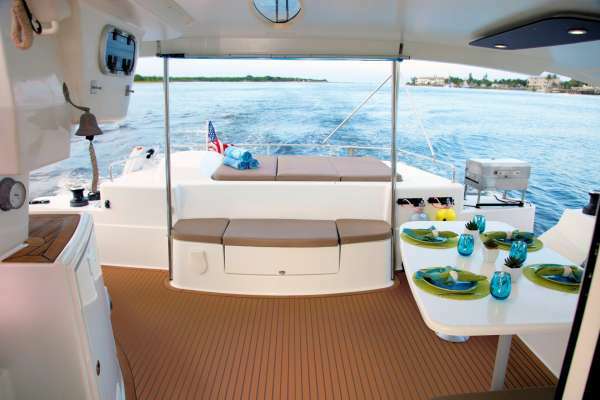 ****SPECIALS***** 20% OFF SELECT DATES Take 20% off 7 night charter for these open dates: APRIL 30-MAY 9, 2019 10% OFF SELECT DATES Take 10% off 7 night charter for these open dates: MAY 24-JUNE 8, 2019 JUNE 24-JULY 6, 2019 This offer MAY NOT be combined with any other offer. MINIMUM NIGHTS: 7 BOOK BY: 01-JUL-19 EXPIRES: 01-JUL-19 . .
Captain Ben is at your service! Get ready for his wonderful humor and a "blast in paradise". 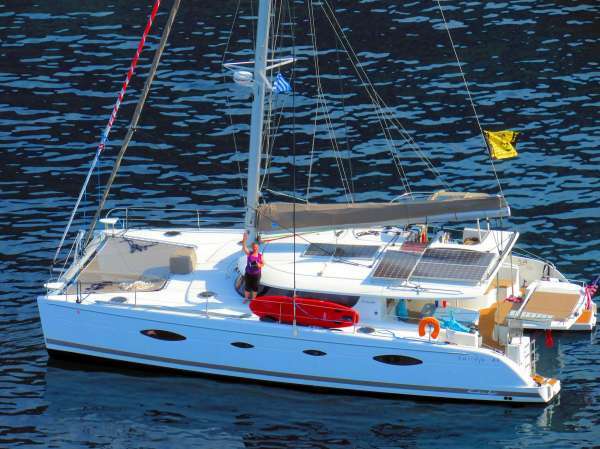 This experienced captain knows how to make the most of the beautiful crystal clear waters and warm sun. As a Florida native, Ben has spent his life in and on the ocean. After working on sailing vessels in the Mediterranean, Caribbean, and United States, he returned to obtain his US Coast Guard license in Florida. 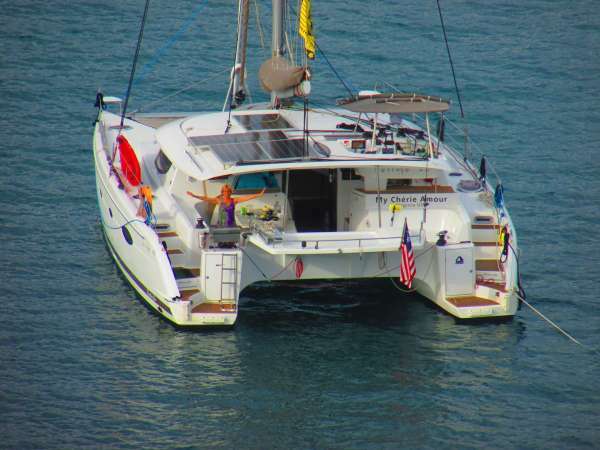 Now Ben is back to where he likes to sail the most, the Virgin Islands! An avid SCUBA and free diver, he can be found in the water chasing colorful fish if he isn't on a boat chasing the wind. His passion for the world underwater is rivaled only by his passion to share its mesmerizing beauty with others. Ben and Holle met while he was studying Communications at University of Central Florida and their tight bond creates a welcoming atmosphere that is sure to enhance your vacation in paradise! Ahoy! Holle will be your artisanal galley master! Growing up, her passion was focused on everything creative. Holle is a fabulous cook, painter, musician, and dancer. Dinner and entertainment all-in-one you might say. 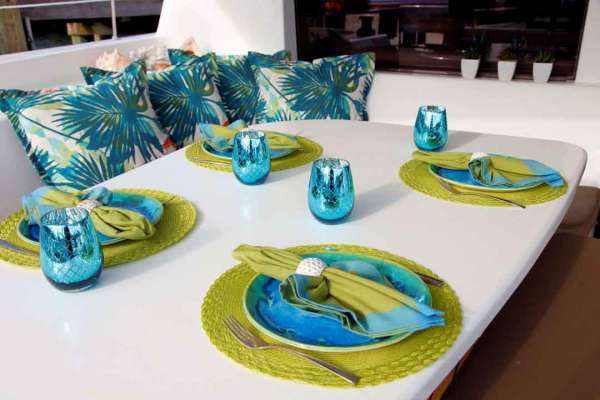 In pursuit of sharing new adventures on the sea, she'll take to the kitchen to prepare snacks, cocktails, and sumptuous entrees for you and your guests. She grew up in Albuquerque, New Mexico and resided in California and Colorado. But while living in Florida, the sun, blue waters and the Captain stole her heart. She looks forward to hosting you and fixing you something deliciously nutritious! 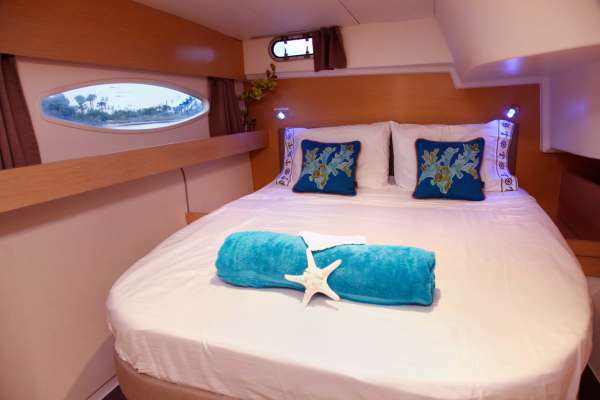 3 equal guest cabins each with queen berth, en-suite private bath with shower (and shower curtain to keep head dry), vanity/sink and electric flush toilet. 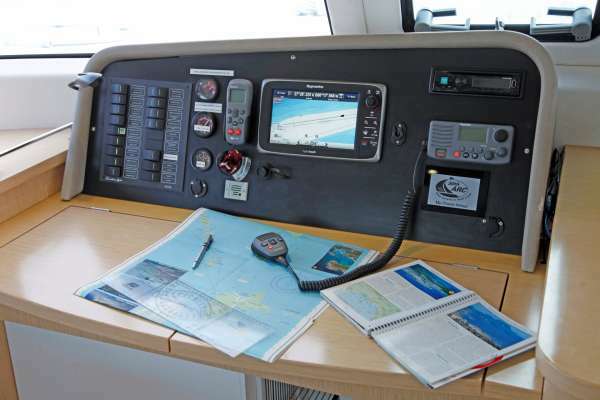 Cabins are equipped with 110v &amp; 220v outlets. 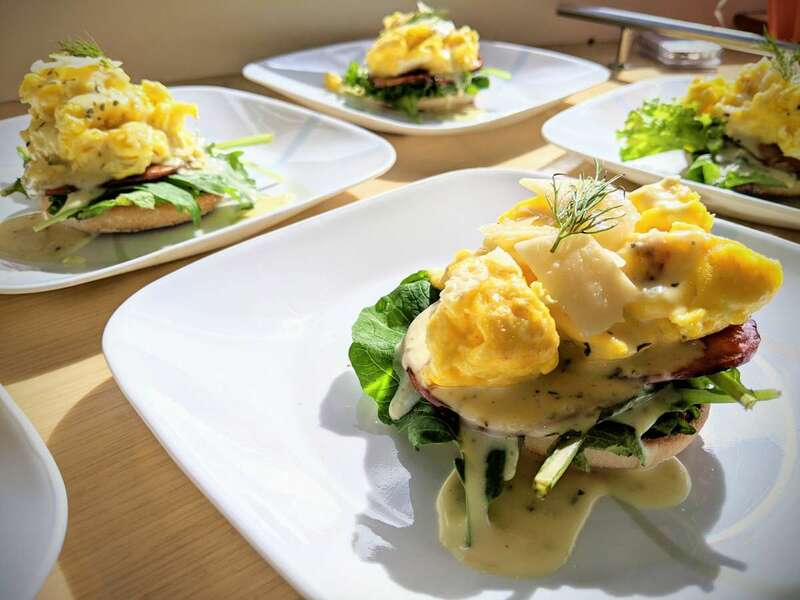 Gourmet galley is fully equipped including Cappaccino machine, ice-maker and more. The salon has an elegant table which can seat eight guests and converts to a coffee table to optimize the spacious lounge area. A raised steering station is fully protected from the sun and seats 3-4 people featuring direct, ergonomic access to the cockpit. 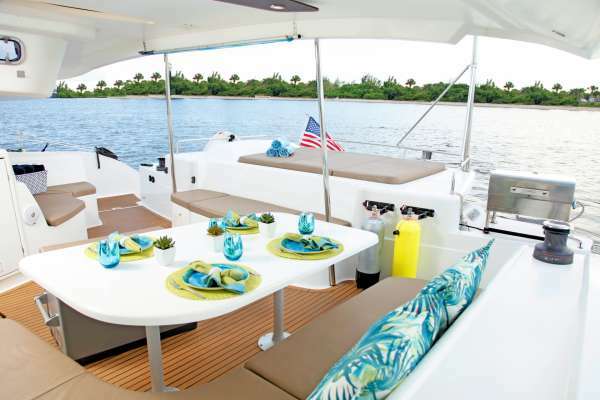 A decadent sunbathing deck at the aft enjoys exceptional protection from the elements while underway and provides yet another idyllic setting for relaxation. 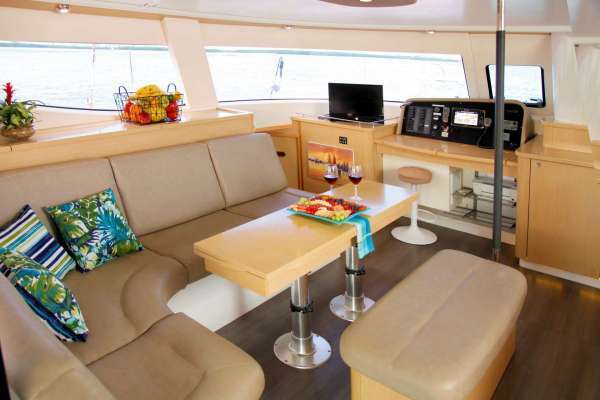 The foredeck offers a seating and lounging area for 6 guests with a magnificent view and breeze. The salon is equipped with a TV and extensive movie and TV show collection. Ships stereo has I-device hookup to play your own tunes. Giant blowup flamingo floats 48"
locally sourced vegetables, served with a side of hashbrowns, crispy bacon, and toast. cream. Served with fresh fruit and amour. sautéed onions and peppers with a little kick of hot sauce and feta cheese to enhance flavor! Served with hashbrowns, crispy bacon, and toast. your choice of bacon or ham. 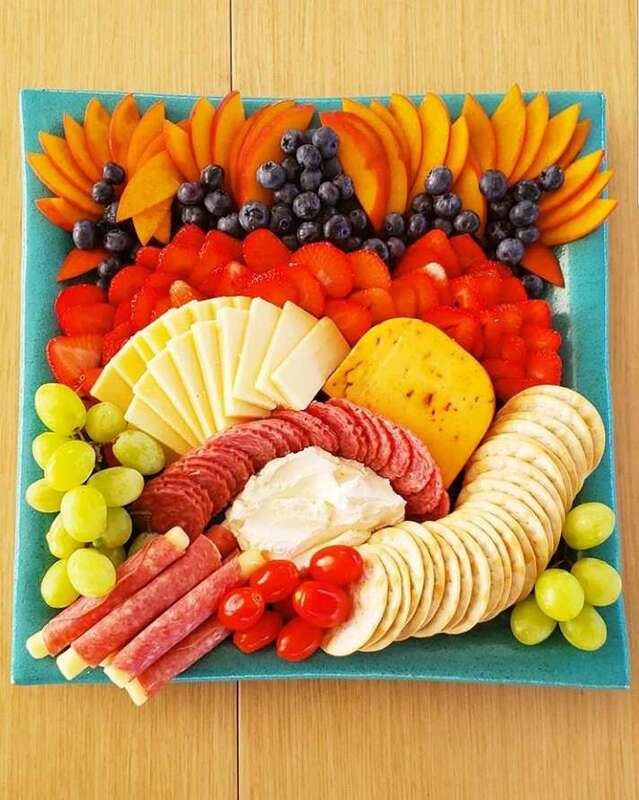 Served with a side of fresh fruit. Assorted Breakfast Pastries: Croissants, danishes, muffins, what more could you wish for! choice of savory mushrooms, ground beef, shredded chicken, or fish. spring mix, and peppered mushrooms. 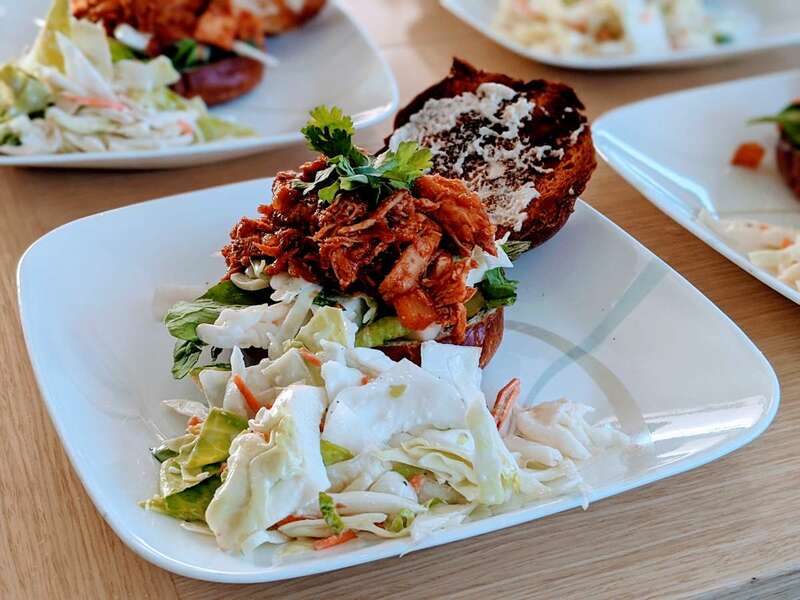 All this on bread covered in toasted, crispy cheddar. Served with a side of potato chips and a dill spear. pitas, and an array of raw veggies for dipping. basil tomato sauce, and topped with grilled shrimp drizzled with balsamic for a tangy finish. with a sweet and sour balsamic glaze and extra virgin olive oil. mushrooms, and lemon slices. Served with sauteed veggies and risotto. choice of chicken, shrimp or robust mushrooms. *Please note, this menu may be subject to changes due to shifts in ingredient availability.